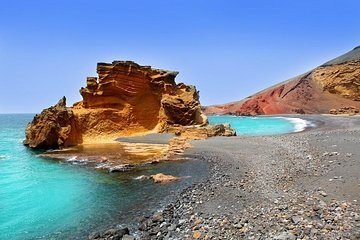 Bewonder het landschap van Timanfaya en het zuiden van Lanzarote tijdens deze 7-uur durende tour. Reist u met een bus met airconditioning, verken het Timanfaya National Park om de vulkanen, kraters en lava-gebeeldhouwd terrein te zien en kijk naar geothermische demonstraties waarin de ondergrondse hitte wordt getoond. Plus, bewonder witte dorpen, groene lagune El Golfo, de kliffen van Los Hervideros en de unieke wijngaarden van La Geria. Een halte voor een optionele kameeltocht en het ophalen en wegbrengen van het centrum van Playa Blanca, Puerto del Carmen en Costa Teguise zijn inbegrepen. The coach picked us up at 09:00. The tour guide was very knowledgeable and informative. However.... the trip felt very rushed and we didn't have enough time to explore the Islet of Hilario in the Timanfaya National Park as well as the adjacent souvenir shop. The wine tasting and lunch break stopover in the afternoon was too long and more time should have been spent exploring the southern region and the Timanfaya National Park. The wine offered actually tasted terrible it certainly wasn't some of the best wines the island has to offer. The coach eventually dropped us back at our hotel around 15:30, however I was expecting drop off to be nearer the 16:00 mark. Another half an hour would have allowed more time to explore the scenery at a more leisurely pace and would have enabled us to visit the lovely souvenir shops en route. Unfortunately we couldn't visit the volcano because of the strikes. We were not told this until pickup on the morning. They did include a buffet lunch and camel trip but it was shortened overall. It was also in 4 languages..... the Germans and Spanish in our party talked loudly over the English commentary making it difficult to hear information. I thought the trip was very good. The tour guide was excellent and they waited for you at the camels which were delayed. I didn't like the audio on the volcanoes tour it was loud and dated, would have much preferred the tour guide to do something. The wine tour I personally felt was not needed.